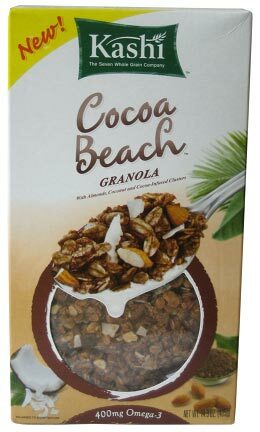 I love Kashi, so I picked up a box of Cocoa Beach.. A coconut, cocoa and almond granola cereal. Yummy. The cocoa isnt sweet, its actually more savory.. and rich.. and it goes really well with the granola. The coconut is completely tasteless.. its almost like its not even there – even though there is plenty of it. One of my new favorite granolas.. Especially tasty on a bowl of vanilla ice cream. New favorite dessert.. Strawberry Preserve Bars – from one of my favorite recipe sites – recipezaar.com. I made my own strawberry jam from my recent strawberry picking session, and making your own homemade jam makes such a difference – ill post the recipe for the jam later.. But I should note, my new favorite farm for pick your own is Lees Turkey Farm in NJ. Beat 3/4 cup margarine and sugar until light and fluffy. Add combined flour, soda and salt; mix well. Stir in oats and nuts. Reserve 1/2 cup crumb mixture. Press remaining crumb mixture onto bottom of greased 13 x 9-inch baking pan. Spread the strawberry preserves over the first layer. Sprinkle with reserved crumb mixture. Bake 20-25 minutes. Cool. Melt Chips and 4 teaspoons margarine over low heat (or microwave), stirring until smooth. Drizzle over crumb mixture. Refrigerate 1 hour; cut into bars. This recipe is perfect for after you go strawberry picking, and have made a ton of jam to give away and still have too much jam left over.. make bars and put that jam to use! SOO good served warm on top of ice cream, and most people have the ingredients handy to make it on a whim.. thats another reason I like it so much!